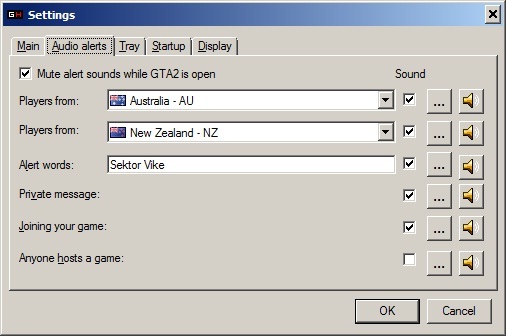 You may need to run GTA2 Game Hunter as administrator for it to be able to launch GTA2 without crashing on startup. Download the latest version of GTA2 from here. Awesome new look! I can't wait for the release! Great job! !tbm 3 Wario5 Please don't spam #gtamp.com in blue. Few suggestions for you from me. 1) There should be option in settings window: Minimize to tray. So whenever this checkbox is checked then app is minimized to tray when minimize button is clicked. If this checkbox is not checked then app will just minimize itself. 2) "Sign out" should also have some option in settings window, that allows to set confirmation like: "Are you sure?" or something. Today i wanted to minimize it to tray, but i clicked Sign out by mistake, it signed out without any warning. So in general: there should be few more checkboxes, that allow user to set these notifications on and off. 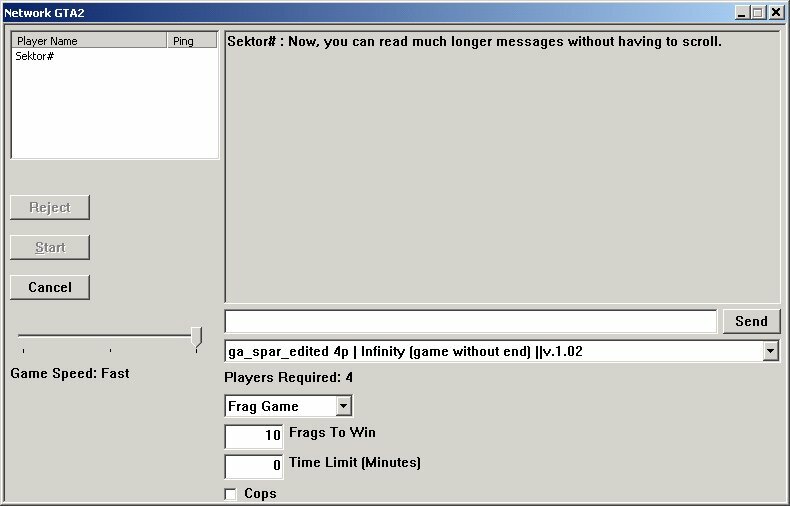 I'll add an optional quit confirmation and perhaps one for joining games or the option to make it require a double click. One thing I hate is Hamachi launching when I click a game that I didn't notice was a Hamachi game. I'll also add the option to send to tray on minimize. I added a few more items to the todo list in first post and updated some of the screenshots. I added GH into Startup menu on XP. So whenever XP boots, GH is executed. What if you add also option, "Minimize to tray at startup"? I think it doesn't hurt. Yep, i put it there. So i don't have to launch it manually. Added a new image. Updated todo and completed lists. The map selection screen can now display jpegs. If the map is called ghetto.gmp then you need a jpeg called ghetto.jpg in the GTA2\data folder. The image resizes with the correct aspect ratio when you resize the window. Check the first post for a screenshot of the new map selection screen. only jpgs? cannot be an gif? I could look for gif if jpeg isn't found. All the map images on my site are jpeg, so that seemed the most logical format to load by default. On this topic, these images can be custom made by users making in game screenshots. Complete top down map images ( Utilizing Editor screenshots with photoshop stitching required ) or seeing if Trademark of FI could or let us share his tool to make top downs or 3D images of complete maps to include in existing map archives posted on your site. Hopefully the map creators will include a nice gmpfilename.jpg within their map archives to extract with everything else to data folder. I'm hoping that we can spread the word to include a complete map view of the map with the map name, author and maybe creation date on top of the image for easy viewing using my poster as an example which I'll resize and include in the next release of DAFES Death Valley. Check map section of forum to see what I mean. I've also noticed that the audible notifiers stop working on occasion and haven't pinpointed why yet. I can fix by relaunching GH. Testing the sounds in settings works at the time of failure. That's all I can say about it right now. I need to find someone who is also beta testing in North America to launch game with for further tests. if player dont have map then will display pop-up with text: You need to download this map. Do you want to do it? If you choose yes then gh will open link contained in mmp file. I dunno what GTA2 would think about line like "Download" in MMP file. Is it even allowed to put anything you want into MMP. GTA2 maybe will throw error. I don't know. Never played with MMP. GTA2 just seems to ignore extra lines in there but I could check if the map is on my site without needing the download link (just keep a database of map files and checksums). In new map editor it will be easy to create screenshot of whole map to any format you need. Loading animated gif would be too much effort but I could load some other image types. 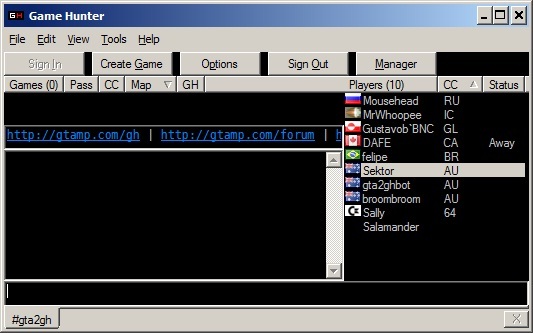 Vike made the GTA2 network window, chat history, chatbox and map box much wider. The cops checkbox is too close to the bottom but that will be fixed. Mpaddon isn't needed anymore.